Central PA members start thinking about earning your APR in 2018! The PRSA Mid-Atlantic District and its members orchestrated the country’s third successful PRSA Accreditation in Public Relations (APR) district boot camp, April 5-8, in Richmond, Virginia. The boot camp attracted 17 APR candidates. 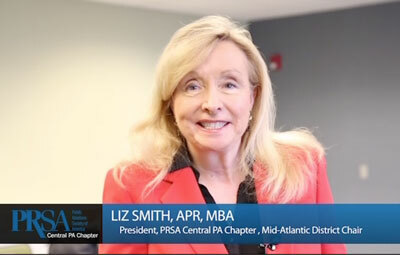 “Our district is the only district in the nation to sponsor an APR boot camp, and now we’ve conducted one three years in a row,“ said Liz Smith, APR, who served as Mid-Atlantic District chair in 2015 and spearheaded the boot camps with the help and support of PRSA National and host chapter Richmond. She served as a Day One boot camp trainer to prepare candidates for their afternoon panels, with co-trainers Lindsay Grant, APR, Richmond Chapter’s APR chair and host, and Kristen Obaranec, APR, from the National Capital Chapter. Kathy Mulvihill and her staff from PRSA National reviewed applications, set up registration and organized panels. The Richmond Chapter served as the host chapter due to its support, hospitality, centralized location and proximity to a Prometric Testing Center for candidates to take the test on Day Four of the boot camp. The number of seats available for the boot camp is limited by the number of seats available at the testing center. Mid-Atlantic District and Richmond Chapter leaders stop for a photo: From left to right, Greg Surber, APR, 2015 accreditation chair of Richmond chapter; Andrew Ryan, APR, chair-elect Mid-Atlantic District; Kevin Gaydosh, APR, immediate past chair of the Mid-Atlantic District; Liz Smith, APR, 2015 Mid-Atlantic District Chair and boot camp leader, and Lindsay Grant, APR, accreditation chair of Richmond Chapter. It is very important for candidates to start preparing for the boot camp months in advance by completing a questionnaire and portfolio and studying for the exam before the boot camp. PRSA National offers a study guide and public relations textbooks for students to read prior to the boot camp. Most candidates use the study guide and read one of the recommended textbooks. “If you are considering attending the Mid-Atlantic District’s 2018 Boot Camp, it is not too early to start planning,” Smith said. (Dates for the Spring 2018 Mid-Atlantic District boot camp and location will be announced by December 2017.) The boot camp is open to APR and APR+M candidates located within the district and throughout the nation. Refer to the outline for the recently completed April 2017 boot camp to understand how a boot camp is organized and how to prepare. Also, review the important 2017 APR Study Guide for information on the applications process, candidate questionnaire and textbook recommendations. “The district book camp serves as an excellent review and offers helpful advice for taking the test,” Smith said. The 2017 Mid-Atlantic District APR boot camp sells out quickly and attracts candidates from the Mid-Atlantic District and as far away as California. “Together we are paving the way to increase the number of APRs in the Mid-Atlantic District and across the country,” Smith said. “Most chapters in our district do not offer APR training sessions, especially with national-caliber trainers, so there is a real need for the district boot camp,” she said. Jason Kirsch, APR, and Amy Hill, APR, served as trainers on days two and three of the boot camp. Kirsch, Hill and Smith are all volunteers from the Central PA Chapter. APR candidates had positive comments about the boot camp, and the test passing rate was excellent. Pictured above: PRSA members from throughout the district volunteered their time to help with the Mid-Atlantic District Boot Camp. From left to right, day one trainers, Kristen Obaranec, APR, from the National Capital Chapter; Liz Smith, APR, 2015 district chair and boot camp leader; and Lindsay Grant, APR, Richmond Chapter accreditation chair and host.